This morning our dear Tori met Jesus face to face and was healed. Last night was my night to sleep upstairs, but I told Brennan, as always, to text or call if he needed anything. My phone rang at 5:01am and it was Brennan. As I struggled to wake up I was trying to comprehend why he was calling. I then realized that something must be wrong with Tori. I ran downstairs to find him holding her, her pulse ox was flat lined and beeping, and she was blue. We used his stethoscope to try to find a heart beat but there was none. We were not entirely unsurprised but it was still a shock. She had been having some “blue episodes” lately and we had a feeling the disease was progressing quickly. Still, she had been doing so well! My parents (who were in the basement) heard us crying and came upstairs. My dad took her and held her so we could make calls. He held her skin to skin and she was definitely not breathing. No pulse. And then, a sigh. A deep breath followed by silence. And then another. We hooked up her pulse ox again and she was alive! We cried and held her and praised God for this chance to say goodbye, if that is what needed to happen. The hospice nurse came out and assessed her and said she seemed to be doing great. Her numbers were perfect and she was comfortable. We were hopeful that maybe she would bounce back and that we would have her for a few more months. I took a few pictures of her with my camera and my phone while she was resting, just in case it was my last opportunity. Brennan and I put her in the middle of our bed and cuddled with her. We laid down around 7:45am and all fell asleep. At 9:01am the pulse ox beeped and I woke up to suction her. Her numbers continued to drop and she didn’t take another breath. Brennan and I told her we love her and said that if she wanted to go to Jesus it was okay. God answered our prayers in many ways today: we were both there, we were at home, we got to say goodbye, and she went peacefully. She had so many adventures in her almost twenty months of life. She brought so much joy to so many. And, most importantly, her life will save lives! We will never stop fighting for Newborn Screening for ALL babies. And, we chose to donate her brain to research to further the knowledge her doctors have of Krabbe so that they can one day find a cure. Her Celebration of Life will be on April 9th, details to follow. It will be a joyous day filled with love because she is with JESUS in Heaven. She is healed! She doesn’t need oxygen any longer, she doesn’t struggle to swallow, and she isn’t in pain. Because of our faith in Jesus and what He did this Easter weekend 2,000 years ago, we have the hope that we will only be separated from her for a short while. We will one day be reunited with her in eternity and she will be WHOLE. She will be able to run around and talk and smile again. A GoFundMe has been set up to help us pay for any expenses that arise: https://www.gofundme.com/exw54vq4 If you feel led to help in this way, we would appreciate any donation you can give. Prayers for your family. Thankful you were there and could hold her. I am crying as I read this because I feel like a Tori and you are part of my family. Love and prayers to you both. Your sweet baby girl is in Heaven and you will be reunited with her again one day. You have all been an inspiration to me and many others. Thank you, once again, for sharing Tori’s story and your beautiful faith. Rest in peace sweet angel. Prayers and hugs for all of you…. What a glorious day for Tori. She is free. How awesome God gave you 4 more hours to love on her, let her know how much you love her and that it was ok for her to go be with Jesues. I can see her now running into his open arms. No more pain and suffering. God needed a special little Angel and he chose Tori. You now have a special Angel watching over you. When you see a Butterfly flying around you and following you just know that is Tori with you. God will help you get through this. You are the two strongest people I have met. You also have an awesome family support. God bless and keep you. Sending hugs, prayers and love. Rest in peace Tori. I am so glad you got to spend your last hours with the people who love you the most. I was so blessed to be able to follow your journey for the last few months, even though I only “knew” you this calendar year. You were and still are a very special girl. My thoughts are with you and your family. Rest easy sweetie! You are brave, loving, and faithful parents. Tori was so lucky to have both of you! In the days ahead, rely on your love, bravery and faith to get you through as you travel a path that no parent would ever choose to travel. My thoughts and prayers are with you and all who loved Tori. So sorry for your loss, but also so thankful that Tori was chosen to be your daughter. Thank you for sharing your story. As heartbreaking as it is to lose her, God used her 20 months in more ways than others who have decades. We will see our little girls again and I praise Jesus for the hope of that day! But until then, i will pray for you both to be able to grieve but rejoice in the blessing she was and to so many others. God bless. Although I have never met your family, I have followed your story through Facebook for many months. All of your posts have been so encouraging and brought me joy. I am so sorry for you loss, but am also so encouraged by the faith and hope you share here. I will be praying that your memories of Tori bring you joy and strength as you go through this time of transition in your family. Thank you for sharing her story with us. My heart breaks for your family, but I know Tori is healed and that you will be reunited one day. I’m happy you had a chance to say goodbye, and that your family was with you. My heart is breaking. God bless you. She is healed. She is whole. She is residing in heaven with our Lord and Savior on this blessed Easter Sunday. I’m so thankful she passed peacefully and on a day where we are reminded that death is conquered and is not final. She now knows Jesus in a way that we can’t imagine yet. Praying for peace for you guys. No. This was the last thing I expected this Easter morning. First, I’m so, so sorry Lesa and Brennan. There is nothing harder for parents. But it’s EASTER! Resurrection Sunday! What a day He chose for Tori to join HIm. Tori is healed and forever with Jesus, whole and happy and waiting for you. Maybe she’s met our Nathan by now. 🙂 Please know how loved your family is, from one corner of the world to the other. I’m joining my prayers for you with those of so many, many others this morning as you begin the next step of your parenting journey. You’re still parents…Tori is in God’s arms, waiting for you. How wonderful that you had those extra few hours to be with Tori and to help usher her into God’s presence. And you’ll continue to have an impact on those around you, both for the Lord and as advocates for Krabbe awareness. I am very sorry for your loss. I found you and Tori when I searched for special needs families. I found a family not broken by Tori’s disease, but strengthened to give Tori as normal a life as possible for as long as she had. I read this post and teared up, and then reflected that if it had to happen, it happened on Easter. TY for sharing. Praying for you both and your family. Thank yiu for sharing your beautiful little Tori with us. Such a beautiful little one, such an ugly disease. Thank yout for bringing awareness to those of us that had never heard of this horrible disease. With each post, each picture it was and is evident that your strong faith in Jesus Christ as your Savior carries you through. Lord bless and keep you and give you His peace unail that day when you see your precious Tori again. Hi I’ve been following Tori for a few months now, I could see how very loved she was and that is everything that matters in life. I am glad that she is no longer sufferering but very sad that she has gone, she was a very beautiful sweet innocent child – God’s work personified. may Tori rest in heaven. Thank you for sharing your journey with us. It’s so awesome to know that Tori is now healed and that you will see her again. To have the mental fortitude to write this is amazing. I was just reading this (choked up) to my husband, and he remarked that it reminded him of Lazarus. Jesus used Tori to demonstrate His power and his ability to perform miracles. On Easter! God bless you. You will all be in our prayers. Heartbroken that your precious Tori is gone from you. The knowing she is with Jesus is more precious than words, but the separation is so agonizing. I can only imagine those great big beautiful eyes wide with wonder as she saw a Jesus and Heaven for the first time. And the huge grin and giggles as she ran to meet Him face to face!! Love and prayers to your whole family. Oh my heart – I am so truly sorry for your family’s loss. My heart breaks for you. I have two children in Heaven. Our first baby passed to Heaven in our fifth month of pregnancy and our youngest daughter passed to Heaven on May 18th six days before her 31st birthday. The pain of child loss is so deep. I have followed your FB page and have been praying for you and Tori. I am so very sorry that she is not here with you. My only peace is knowing that one day when the Lord calls me home, I will be with Amanda and my baby again. My prayers are with you from one grieving parent to another. God bless your family, what a perfect day to meet Jesus! I have been following your blog daily for a long time now, praying for Tori’s healing and, as a nurse, looking for any signs of that in your posts. This morning I was shocked to read your entry and am so very sorry for your loss, but happy for Tori’s healing at last. It is significant to me that she passed peacefully on Easter Day. What a joyful reunion this day must be for her in Heaven with all the saints. And now, I pray that God will send comfort to you and Brennan as you grieve for Tori and continue your life together. Not what I wanted to read this day. What a beautiful little girl and what wonderful parents you were. I know you and Brennan have a deep faith and this will help you through the loss of Tori. Remember she is only on another room. She is still with you and you will see again one day. May the Lord bless and keep you and make His face shine upon you. My deepest sympathy. I loved following Tori’s story..
What an incredible story of this little girl’s time on Earth. You, as parents, did an absolute amazing job giving her the chance to live her life to the fullest. I had chills reading how she passed today (of all days!) and how He was there to help ease the pain. God bless you all and Rest in peace, little Tori. Knowing that Tori has gone to be with the Heavenly Father this Easter the celebration of Jesus’s resurrection is a powerful blessing bestowed upon her. Tori was a powerful blessing to those who knew her and those who had the chance to read about her life. Rest and let God …. I read your post just a few minutes ago, as I am subscribed to your blog through email. The news has left me in a state of confusion with different emotions… anger at this disease, and at our country and the states for denying infants their chances to truly live; sadness that Princess Tori had to personally know this disease and its symptoms; thankfulness to the Lord for blessing Princess Tori with an everlasting, peaceful life now filled with joy and happiness. More words, I just cannot find to say. Except to tell you I will continue to uplift you in prayer. The Lord is with you, I fully believe. My heart aches for you. Tori is healed and with Our Lord Jesus. That truth brings us joy and hope yet it is so very sad that she is not with you……….. Though I had tears come to my eyes at the loss of your beautiful daughter, I marvel that on Easter Sunday she had a “mini-resurrection” in your midst, and then she took her final resurrection journey with Jesus. This day is the most holy day of the year and it so fitting that your precious child knew today was her day. Romans 8:11 speaks loudly: God raised Jesus from the dead, and if God’s Spirit is living in you, he will also give life to your bodies that die. Tori’s body is more alive now than it ever was and your future reunion with her reminds me how beautiful heaven will be. Big hugs. Very sorry to hear of Tori’s passing, I have followed Tori and loved seeing all the bucket list things you guys have done. I am glad that she’s no longer suffering. Your family is in my prayers. While I have only recently returned to Brennan and your lives, I feel blessed that I got to know Tori through all of the photos you shared. Hearing Brennan talk about Tori and you when I saw him a few weeks ago, I know Tori was much loved by both of you and will be missed. But as you shared, she is in heaven now and no longer suffering. OH Lesa and Brennan, my heart goes out to you!! I was choked up as reading and felt so sad for you both, but at same time had goose bumps at how God let you both have a little longer to say goodbye this morningT And also choked up about how this is Easter and I think of one of my favorite songs, Because He lives I can face tomorrow….and I pray that as you and Brennan and your family endure some hard days ahead in missing sweet Tori that you can keep hanging onto that HOPE and STRENGTH that God gives as you face each tomorrow! Bless you for the ministry and inspiration you have been to many as you have walked this journey with your precious daughter and I will say that I look forward to meeting dear Victoria in heaven someday! Omg so sorry for your loss. But she is free now. Have followed your story online Thanks so much sharing ya’lls life story with us. 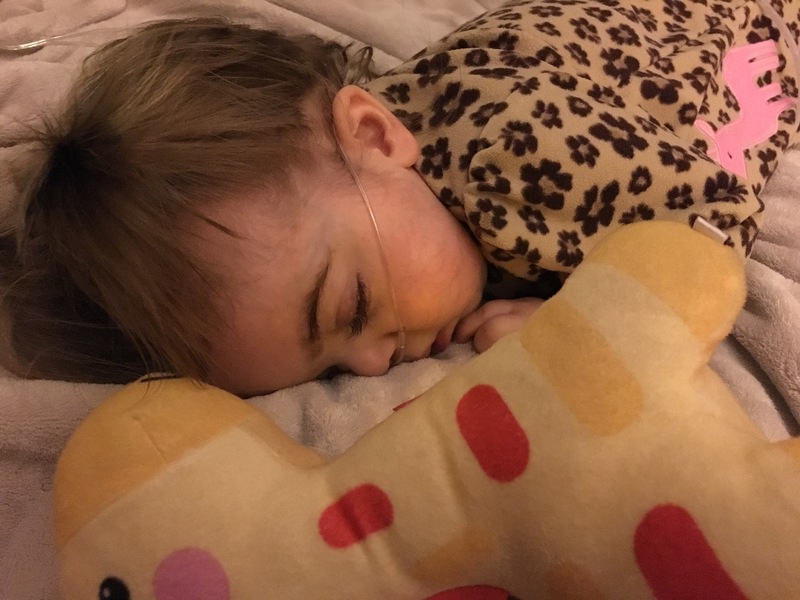 I have a little granddaughter that lost her life to a rare chronic lung disease and there is nothing so hard as watching or little ones suffer. I hope her and Tori have now met and running and playing together. My thoughts and prayers are with you all. I am so sorry for your loss. May you be filled with God’s peace. I read this with sadness in my heart knowing your incredible loss. God is with you. Praying for you all. God bless you with His continued presence, strength and comfort. Hold strong to the knowledge of where she is and what a unbelievable time she is having in her new body and home. Thank you for sharing your lives and Tori with us all. We have all been changed due to your incredible journey and faith. Prayers and hugs! I saw this for the first time tonight. What a beautiful testimony of how great God is. I know your hearts are sad and broken. May you continue to feel the comfort only He can give. Prayers for you and your family as you go through the days ahead. So very sorry for your loss. RIP Angel Tori. Sending prayers of peace and comfort for all. God bless. Will miss this little Angel very much. I am so very sorry for the loss of your precious baby girl. Praying God brings you comfort and peace. My name is Rodney and I just read this. I prayed for the two of you for the peace that passes understanding and the comfort of God to engulf your hearts in this time of such pain. God bless and keep you and your families. I am so sorry for your loss. I just read this story through Max Barnett blogs. He met Tori and as you know struggles with the same horrible disease. I am his Grandmother and more importantly a born again Christian and although we know that she is with Jesus and rejoicing it hurts to lose someone so precious. Your faith is humbling and will be praying for you and your family. My heart is hurting for you & family, but rejoicing with Tori. She was a beautiful little girl with such pretty eyes. I pray God’s Holy Spirit comforts you & brings you peace during your years of separation. You’ll have eternity to spend together. Praying for you….may God hold you in His everlasting arms and comfort your hearts. So sorry for your great loss….thankful that you will see her again. It was so nice to see you at the Hotel today to voice my regrets to you. You are an amazing couple and your faith shines through. Tori couldn’t have had more better parents, but that was God-ordained too. God bless you both, and I will keep praying for you both in the days ahead. I am so sorry to hear about the loss of your beautiful daughter. My thoughts and prayers are with you during this difficult time. Please now that I continue to lift you all in prayer as God has set a new course for you. Please do not drop off the radar so I know how to pray for you more effectively. Blessings… they are for you and are new every morning… my sister and brother in Christ.